User experience, user interface and interaction design for native iOS and Android apps. In consultation with Accenture and Discovery Channel, London. I worked with the project managers and development teams at Accenture and Discovery at their offices in Chiswick. 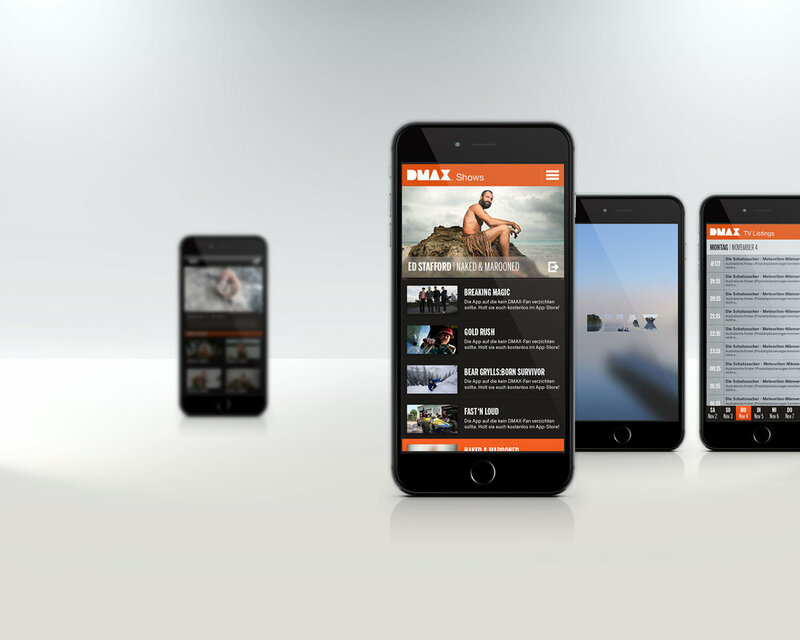 As a UX and UI designer I assisted them in developing the iOS and Android apps for DMAX Germanys video on demand service. In consultation with Accenture. Owned and operated by Discovery Channel. The brand identity was already set and a CMS site had already been designed by my team for development at Accenture. So, for the launch of the new DMAX Germany site, the team also wanted a video on demand app to be developed. As well as working on site with Accenture, I was also responsible for creating and in presenting the following documents to the head of DMAX in Germany, which is part of Discovery Channels European headquarters here in London. Most of our meetings were held on Skype and went very smoothly with agendas sent before the calls. Communications were clear during the iOS development, but there were some hiccups with UX for the native Android app as different members had conflicting opinions. After much testing of similar apps on varying Android devices and whilst also reminding the team of very tight deadlines, I was able to persuade the team of the best possible solutions in the user journey. The apps were simple and easy to use and both platforms launched on time. Made in Adobe Illustrator, a basic site map and wireframes were created and annotated. These were created for presentation purposes and for the project management offshore development teams to understand the structure and functionality of the iOS app. Once the wireframes were signed off, visuals were created for each view and the following instructions were created. Each view is annotated for offshore developers to understand the interactions on the app. Splash screen, home, tv listings, programs, episodes and in-play views. The iPad and iPhone wireframes were created in conjunction with each other so the user experience would be the same between the two devices. When the wireframes were signed off, visuals were created for each view. This was a quicker process than the iPad version as the asset styles had been set by the UI, native to that platform. The native Android application user experience was based on the iOS app.